Window awnings offer you an elegant and practical way to protect your home from the sun’s harmful rays. Our awnings are custom-made and professionally installed, we have retractable window awnings that offer you the control you need to maximize your indoor comfort and control cooling costs. Whether you are looking for a simple way to prevent excess solar glare in your home, or to add style and flare to your home’s exterior, Deck King USA has a wide-ranging selection window and door canopies and awnings. Will drop all the way down for full porch or window coverage. Available in widths up to 30 ft.
Reduces energy costs by cooling the interior of your home. Provides shading for low angle sun. 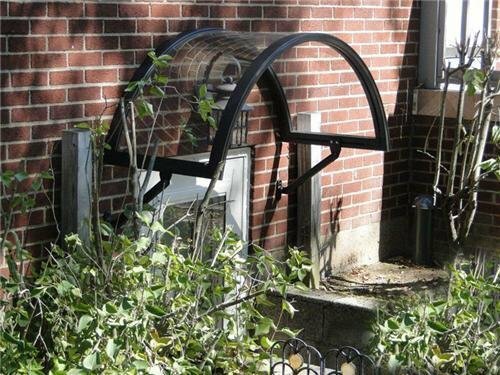 Can be dropped for window and porch privacy. They can be raised up when not needed. Long before air-conditioning was invented, fabric window awnings were found homes and businesses throughout the world providing natural cooling and light control. 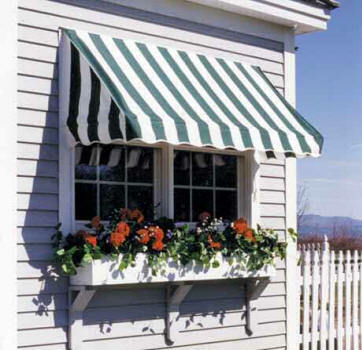 These awnings continue in use today for the same reasons plus you are are "Going Green" 100% American made with long lasting solution dyed acrylic fabric and powder coated aluminum frames. This Canopy can redirect sun, rain, and snow to keep your guests in comfort as they enter your home or business. Elegant stationary awning for doors and windows. 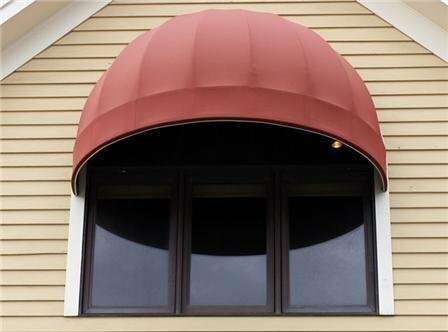 The Dome Awning is a traditional favorite to add interest and elegance to a home or business. Graphics can easily be accommodated with the addition of a rigid or loose valance.